Tactical Aerostats by Allsopp Helikites - Unique lighter-than-air aerostats that fly with or without wind. This would be very small, robust, high altitude, all-weather, instantly deployable, with minimal ground footprint and able to carry significant payload. Much has been written about tactical aerostats for military or police use. Some normal cigar-shaped blimp aerostats ("Blimp" was originally the British Army WW1 shortening for Balloon Limp") are described as tactical when they are still big and unweildy. The blimp aerostat always has the problem of it needing to be big (30 cubic metres+) in order to fly well in even moderate winds. Blimps under 100 cubic metres are seldom able to go above 1000ft and most blimp aerostats cannot fly reliably in high winds however big they are. This is because they are only able to exploit weak helium lift for flight and so are blown down by wind. Helikites, are not blimps. Helikites are semi-rigid and exploit powerful wind lift as well as helium, so a Helikites of only 11 cubic metres can fly thousands of feet high in no wind, or in in gale force winds, and can stay at high altitude unattended for weeks. Launched within 20 minutes, a 14ft long, 11 cubic metre (385cu feet), Skyhook Helikite carrying gyro-stabilised pan/tilt/zoom video camera can provide continious, long-term aerial surveillance over many miles. Manpower needed is just one. Running costs are minimal. Ground handling normal large blimps can be a nightmare in winds over 30 mph, especially at night. This major problem is seldom addressed beforehand in the vain hope that it might somehow magically not occur. So the troops or police end up with serious trouble and risk ground handling huge blimps being whipped around by strong, unpredictable ground winds. In high winds these blimps and handling lines can easily break a mans arm or haul him off his feet and throw him against a wall if he is not careful. Serious injury can be caused and damage to the blimp envelope or the payload is likely. We have even heard rumours that troops in theatre have deliberately ripped open the blimp envelopes with their bayonets to quickly deflate them in high winds. We cannot know for sure if these accounts are true, but it would be understandable if there were not the recommended number of ground-handling personnel available at a critical time. The blimp aerostats long shape and its sensitivity to ground winds will always make it a ground-handling problem. So however light the payload may be, normal blimp aerostats will still need excessive helium, personnel and ground equipment to function successfully in the military environment. We do not consider this truly tactical. These blimps may also have little in the way of long-term mooring facilities or protective hangers which is essential for military use. Helikites are different. Even tiny Helikites can fly in higher winds and to higher altitudes than normal blimps, so Helikites do not need to be large to be all-weather. Therefore as payloads become smaller and lighter due to advances in technology, it makes sense to use Helikites to lift them instead of unwieldy blimp aerostats. Ground handling Helikites is very easy. Helikites under 20 cubic metres can easily be man-handled by one or two people in high or low winds. Helikites of 20 cubic metres upwards are used with an inflatable Helibase which enables their inflation, deflation, launch, flight, and recovery to happen in almost any weather conditions, by only one trained operator - although two is slightly quicker. Helikites can even be launched and recovered remotely - with no people present at all. They are simply winched off or onto the Helibase. This is possible because Helikites derive much of their stability from gravity which is always constant even when the Helikite is in difficult ground winds. As the Helikite approaches the ground, the bouyant balloon at the front of the Helikite and the aerodynamic lift caused by the speed of winching, keeps the front up - thus keeping it out of danger. The back end of the spar is the only thing that may touch the ground and it is protected for this purpose. All the recovery is done via remotely operated winches. Nobody need to go near the Helikite until it is safely pulled firmly onto the Helibase. Then a few extra safety lines can be attached if so wished, or a tarpaulin can be thrown over the Helikite to camouflage it or protect it from the elements. In tactical situations, especially overseas, the number of personnel available is severely limited. Normal tactical blimp aerostats will require a personnel ground-handling requirement from 1 to 10, depending upon the size of the blimp and the wind speed. But nobody can predict the future likely wind speed. So a commander may have to keep 10 personnel on stand-by in case the wind gets up. Considering that the cost of sending one US soldier to Iraq has been estimated to cost US$1 million those troops on blimp handling stand-by are pretty expensive. Compare the Helikite with its Helibase. The commander knows that he only ever has to have one or two people on stand-by, and as these will be needed to monitor the output of the payload anyway, there is no practical increase in personnel required. This saves huge amounts of money that can be spent on other resources. Instant deployment is the ideal. This can never be acheived by a normal blimp aerostat that needs to be inflated prior to use. It always takes a few minutes to inflate a blimp and often some hours for the larger ones. The size of normal blimps precludes them being transported fully inflated. A blimp small enough to fit inflated in a road trailer is not generally able to cope with more than light winds. 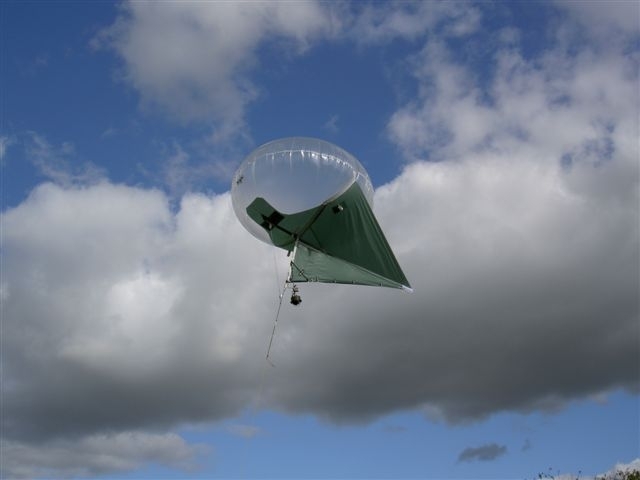 However, unlike normal blimps, Skyhook Helikites of 5 cubic metres or less are small enough to allow them to be kept fully inflated in a small road trailer allowing instant deployment (See products section). These small Helikites are able to fly steadily to altitudes of thousands of feet in winds up to 45 mph. This size of Helikite has enough lift to carry video cameras, radio-relays, sensors etc. A true tactical aerostat. Larger Helikites cannot fit in a road trailer when inflated, but they are still have a far smaller footprint than an equivalently performing blimp and are much faster to deploy. An example is the Mobile Operations Room/Helibase(see products section) created to deploy the 34 cubic metre Skyhook Helikite. The Helikite can be safely deployed within 20 minutes, by two people, from the top of a road trailer capable of being pulled by a SUV. It is designed to provide mobile emergency communication relay. The new Cased Helikite Aerostat Maintainable Platform (CHAMP) (see products section) allows the deployment of a 10 cubic metre Skyhook Helikite within 30 minutes. The unique part of the CHAMP is that it also includes an excellent Helibase with top cover thus also creating a permanent, safe base for the Helikite - not just a minimal launch platform. Normal blimp aerostats are not good in high winds at altitude but they are even worse near the ground. So their practical wind limits are often far lower than is apparent from reading their technical specifications. For example, the huge Meterological blimp at Cardington, UK is capable of flying in winds up to 50 mph, however, it cannot safely be launched or retrieved in winds over 30 mph. So it tends to be brought down as the wind reaches about 27mph - just in case the wind increases as the blimp is descending. Other tactical aerostats may seem to have excellent rapid inflation systems, but these can only function when there is very little wind. These systems are designed for nice weather. If there is significant wind the blimp cannot safely be launched at all - never mind quickly. Helikites are designed for foul weather deployment and foul weather flight. Even the largest Skyhook Helikites can be launched and retrieved in all the winds that they can fly in. So deployment and flight can occur safely in winds up to 50 or 60 mph. This means the equipment needed, and the space on the ground, to transport, inflate, launch, recover, deflate and store the aerostat. Large aerostats need large footprints - especially long, thin blimp aerostats. This is because their large surface area to volume ratio, and their need to be big to cope with wind, means they need far more helium than Helikites per kilo of payload. Helium is very heavy to transport because is does not compress to a liquid at room temperature, but only to a compressed gas in relatively heavy high pressure cylinders. So compressed helium cylinders are very large per cubic metre of useable gas compared to cylinders of carbon-dioxide or oxygen that can be compressed to a small volume of liquid. As much military equipment is moved by scarce air transport assets, it is essential to do everything to reduce the volume of a tactical aerostat. Big aerostats also need big heavy motorised winches and tall, steel towers to moor against that allows them to rotate with the prevailing wind. This rotation requires a large area of flat ground or sea. The winches need inflammable fuel and spare parts. All this equipment needs strong containers to transport it in and trucks to move it as well as numerous personnel to move it - who need housing, food, transport, protection etc, etc. So, creating the ground footprint for a normal blimp aerostat large enough to cope with high winds, is a big and expensive logistical excercise. The ground footprint of an all-weather Helikite is minimal. The C.H.A.M.P. is a self-contained tactical aerostat system with a 10 cubic metre, Skyhook Helikite, Helibase, hand-winch and enough helium cylinders to give months of flying all contained within one 4ft x 4ft x 4ft palleted container weighing only 190 Kg. One person can easily set it up. The heaviest piece of equipment within the container only weighs 15Kg so the load can easily be split up and back-packed by a few soldiers if required. The resting Helikite is not effected by the wind and so does not need to rotate and thus needs minimal space. The 10 cubic metre Skyhook Helikite is a superb aerostat, able to fly to thousands of feet in winds up to 50 mph lifting a payload of 5kg. It will cope with far higher winds than blimps many times its size and yet is small enough to be quickly winched in or out with a simple, lightweight, robust hand winch - that requires no heavy engine, flammable fuel or expertise. Tactical aerostats are often required to be used in mountainous areas where the starting altitude is 5000ft or higher. Air is thinner at high altitudes and so helium lift is reduced and cannot support such payloads for a given volume. This affects all aerostats but the problem is far less with Helikites because Helikites are rounded compared to normal long-thin blimps and so Helikites have a better surface area / volume ratio. Also the wind lift that Helikites can exploit is vital to cope with catabatic winds, thermals and other difficult airs around mountains. Helikites perform far better than normal blimps at high altitude. Helikites are truly tactical aerostats. Deployable within seconds and capable of long-duration, all-weather flight to thousands of feet. They are lightweight to transport, easy to understand and fly. They are very steady platforms in foul weather, have a tiny footprint and only ever need one or two people in any weather. Helikites make mobile, low cost, persistent electric walkcar aerial surveillance possible. They can lift cameras way above the range of small arms fire and often out out of sight of the naked eye for truly covert surveillance. Tactical Helikites enable the instant creation of long-term, reliable, high bandwidth, over-the-horizon communications between personnel and vehicles. This allows internet protocol ad-hoc radio networks to be extended from headquarters out to personnel and unmanned vehicles situated far away. Thus enabling control of unmanned ground vehicles, security cameras, sensors etc. to occur via the internet. So operators situated thousands of miles away can take over the work of local security personnel.